Shell Art – It’s back (who would’ve thought?) | Hey Bernice! 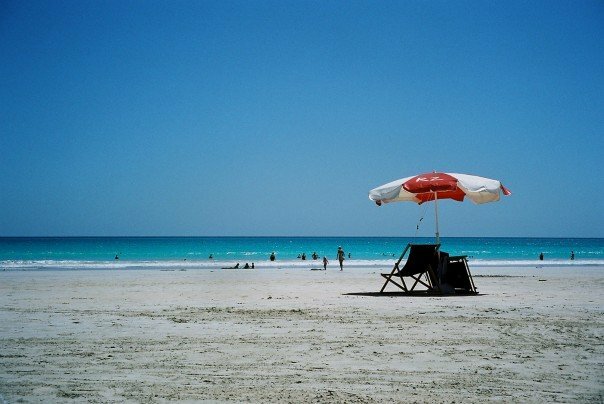 Several years ago I went on a road-trip up the coast of Western Australia – It resembled Thelma & Louise + Bernice! We drove through some of the most isolated country I had ever visited – Wolf Creek territory. If I had watched that terrifying thriller Wolf Creek before embarking on this road-trip, I would have reconsidered, opting for a stress-free beach holiday in Queensland instead! (Which would have resembled: ‘Another gin and tonic’, as opposed to ‘100 litres of Diesel please’). 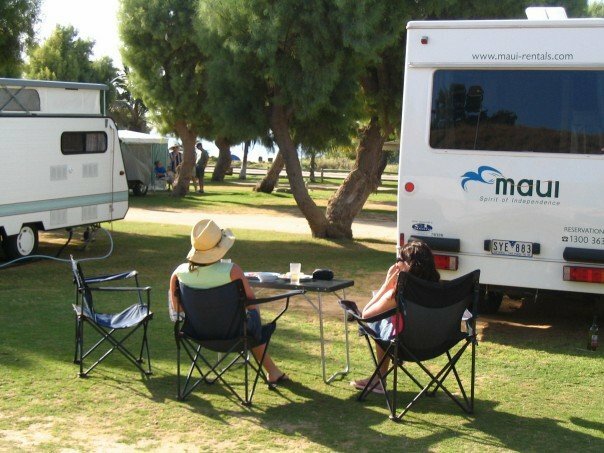 We had the option of hiring a satellite phone with the van – but deemed it an unnecessary safety device accessory. I distinctly recall regretting this decision when it dawned on me how vulnerable 3 girls are in a big van, 100’s of km from anywhere with no communication options. This trip was probably the most idiotic adventurous of my lifetime, and one of the most spectacular and mind-blowing explorations of Australia I have undertaken. I don’t think (between the 3 of us) we knew how to change a tyre; and had zero mobile phone reception most of the 2400km – with often 200kms between sighting anything living (human, fauna or flora – we would have been happy to sight even one of these options at some stages of our travels!). There was one roadhouse that was particularly memorable. Instead of the standard Chiko roll, dimmy or southern fried chicken pieces, the fridges were filled with delicious French pastries. Not Sara Lee style, but fancy bakery quality to the tune of escargo, mille fois and croissant . When I asked the manager where he got these from (’cause he wasn’t exactly in a location capable of receiving daily deliveries! ), he replied “I make them myself”. Let me set the scene here… this guy looked like your stereotypical member of a biker gang – beard, leather jacket, large stomach, tattoos… hardly your resident Gabriel gate! I then drilled a little deeper and discovered that in a previous life he was a pastry chef in Sydney. 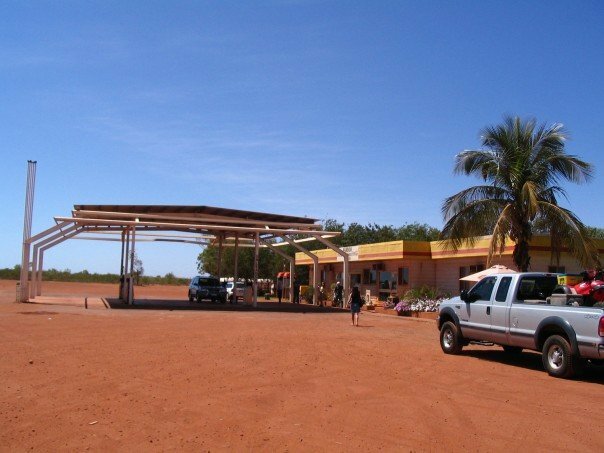 He had decided it was time for a change … so moved 1000’s of km west and took up management of a roadhouse, serving up petrol, diesel and French pastries. He had a full pastry kitchen out the back of the roadhouse to provide for his patrons. I was stunned and impressed at the same time! Our trip followed the Western Australian coastline heading North. As you can imagine we saw some spectacular, untouched beaches. I have always enjoyed walking along the beach at low tide and collecting the surprise deposits from the ocean. I wasn’t aware of the dramatic extremes in tides experienced in Western Australia – which makes for amazing shell collecting with such a huge expanse of beach left covered with shells – daily. Thelma, Louise + Bernice stayed a day and night at Eighty Mile Beach (halfway between Port Headland and Broome) and a good proportion of the daylight hours were spent collecting the unique shells deposited on the beach(you’ll be happy to know we didn’t inspect the entire eighty miles – although I was tempted!). 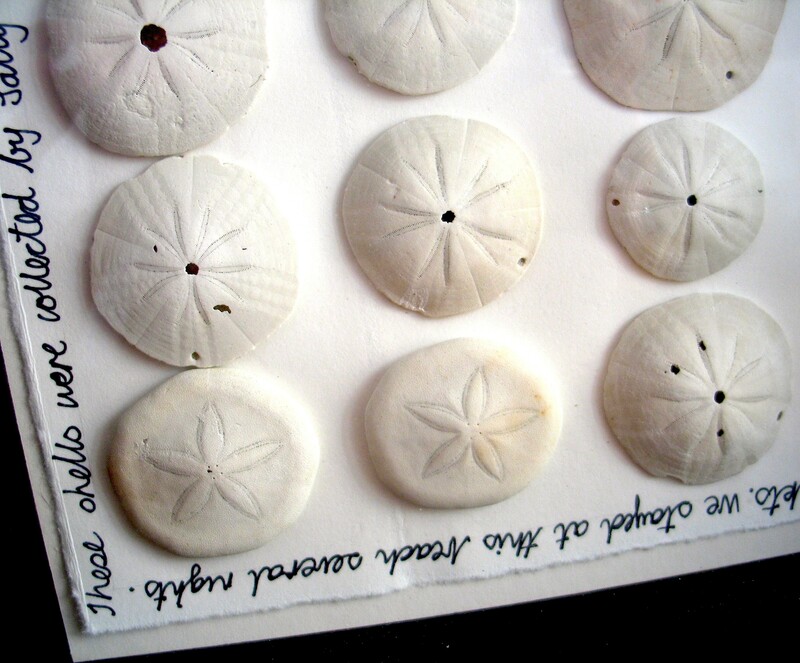 I have since discovered that the round shells are from Sand Dollars, which are invertebrates (echinoderms), relatives to sea stars, characterized by a spiny circular shell. Alive, the sand dollar has purple and brown shaded spines. The five point star is the field identification mark for the back of the shell. I have no idea what the other shell is called – but if you use your imagination, they look like really (really, really) long fingernails that someone has kept after they broke off. You may not want to admit it, but I bet every one of you has a secret stash of shells at home crying out for a purpose. Collecting shells is a funny pastime, because you rarely do anything with them (unless you were one of the many who made shell mirrors in the 1980’s – and we all know that fad came and went very quickly). Being the hoarder that I am, I have to keep all my shells – after all, I have spent hours hand-picking each one out from the crowd, why would I throw them away? However, the dilemma remains – what can I do with my shells? Finally, four years after collecting these shells in Western Australia, an artist in Noosa provided me with some inspiration. They used different shells stuck within a frame in varying patterns. They then wrote with fine black pen next to and around the shells. They used much larger white, boxed frames (and charged a small fortune for them). Armed with this new inspiration, I set about doing something similar with my shells. I used Ikea frames, which are 23cm x 23cm, box frames. Unfortunately you can’t use normal frames because the glass sits against the image/artwork within the frame – you need space between the glass and the back of the frame for the shells. I then went to a quality paper shop and purchased some good quality thick white/cream paper to stick the shells onto. Rather than cut the paper to size, I tore the paper with a ruler, to get a rough edge, and ensured that the paper was slightly smaller than the inner border of the frame (so you can see the rough edge). I then stuck the shells in an even pattern to the paper with craft glue (the white version, not clear). To make sure that the paper doesn’t buckle as it dries, I rested a heavy book on top of the shells to keep the paper flat. 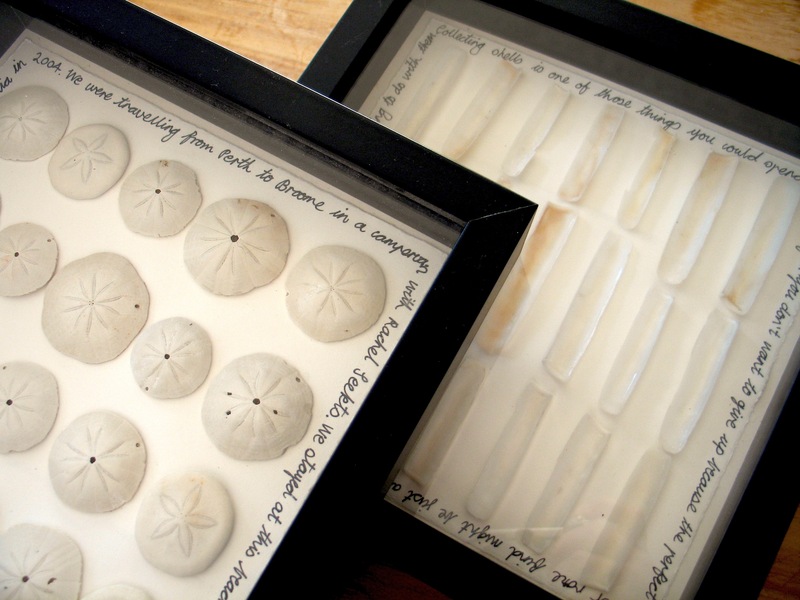 Once the glue has dried you can take your fine black pen (not a biro or Bic pen – preferably a fine nib pen from a newsagent or art supply shop) and start to add writing/descriptions next to the shells or around the outside of the frame – wherever you like – again, there are no rules! Make sure you test the pen on the paper before you start writing, as sometimes certain ink will bleed on high quality paper – you don’t want that to happen to your finished masterpiece. Then glue your paper with the shells and writing to the backing cardboard that comes within the frame (the piece that has a square cut out of it to frame a photo/image). You then have your very own shell-art! Now you can hold your head high and be proud that you have been a part of the shell-art revival. I have my shell-art proudly on display above our toilet. I figured it would give the males something to occupy their minds when using the bathroom! Who would have thought indeed! Art this beautiful deserves more than a revival Bernice. It’s gorgoeus. Can you lead the revolution? Thanks Jennifer – Mystery solved! As a fellow shell collector I thoroughly approve of your sand dollar display. The crisp white and black is perfect for a bathroom. Thanks for your kind words, I’ll be moving to the beach soon so hopefully add some more shells to my collection. Shells are such a wonderful raw material for art and craft. Happy hunting! Shell Art is celebrating the Natural Environment as long as the shells used are Eco collected – no harm/no evictions. Awesome respect for lives spent building these homes!